Kanye West deletes all his tweets about Donald Trump. Well, that didn't take long. 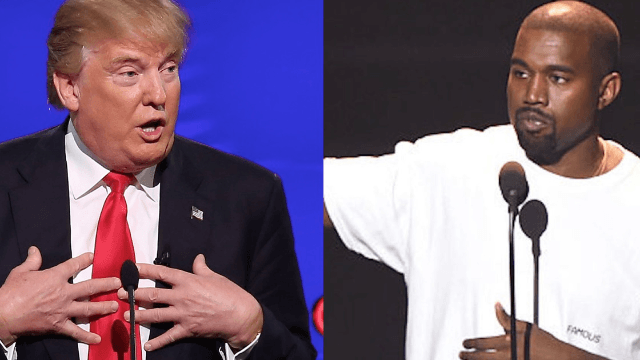 According to TMZ, Kanye West has deleted all mention of President Donald J. Trump from his Twitter because he is "super unhappy with the president's performance over his first 2 weeks in office." In 2016, West caused controversy when he announced that he would have voted for Donald Trump over Hillary Clinton in the 2016 election during a stop on his Saint Pablo concert tour (for the record, West did not vote at all). Soon after, West canceled the rest of the tour dates and was hospitalized for after having a nervous breakdown. After Trump was elected, Kanye stoked the fire by having a meeting and photo op with Donald Trump at Trump Tower in New York City. Although West claimed that he was meeting with the President to "discuss multicultural issues," fans and celebs alike, including John Legend, speculated that it was all a publicity stunt. Following the meeting, West tweeted out an autographed copy of Trump's issue of Time and urged his fans to stay open-minded about the 45th president, justifying the visit with a tweet that read "I feel it is important to have a direct line of communication with our future President if we truly want change." West's wife, Kim Kardashian, supported Hillary Clinton during the election and recently tweeted these statistics to show why she disagrees with Trump's unconstitutional travel ban. Knowing West, he is probably still pissed that Trump wouldn't let him perform at his inauguration. It's like these two are having a contest to see who the bigger narcissist is and they're both winning.